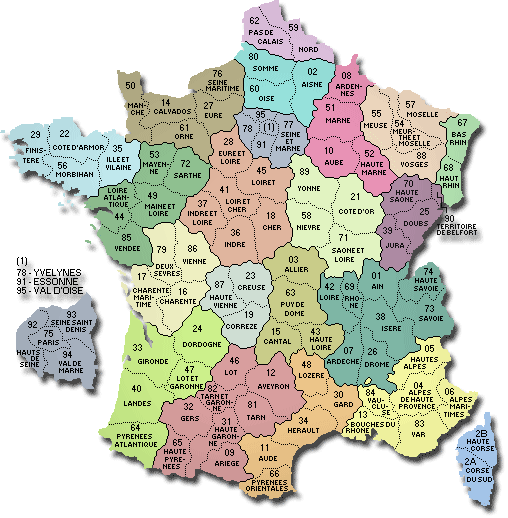 - 96 departments in mainland France, numbered 1 through 95 plus Corsica: 2A and 2B replacing the number 20. - 5 overseas departments (which are also regions) : Guadeloupe (971), Martinique (972), Guyana (973), Reunion (974) and Mayotte (976). Note that Mayotte in mars 2011 obtained the status of department (and region). Here, in alphabetical order, the list of metropolitan departments. The name of the town is written in black on the right of the name of each department. Click on the name of a department to view its map, its cities and detailed informations. The department is the second-level administrative division of France. This division into departments is between the region and the district. Each department belongs to a single region. (Each overseas region being composed of a single department). 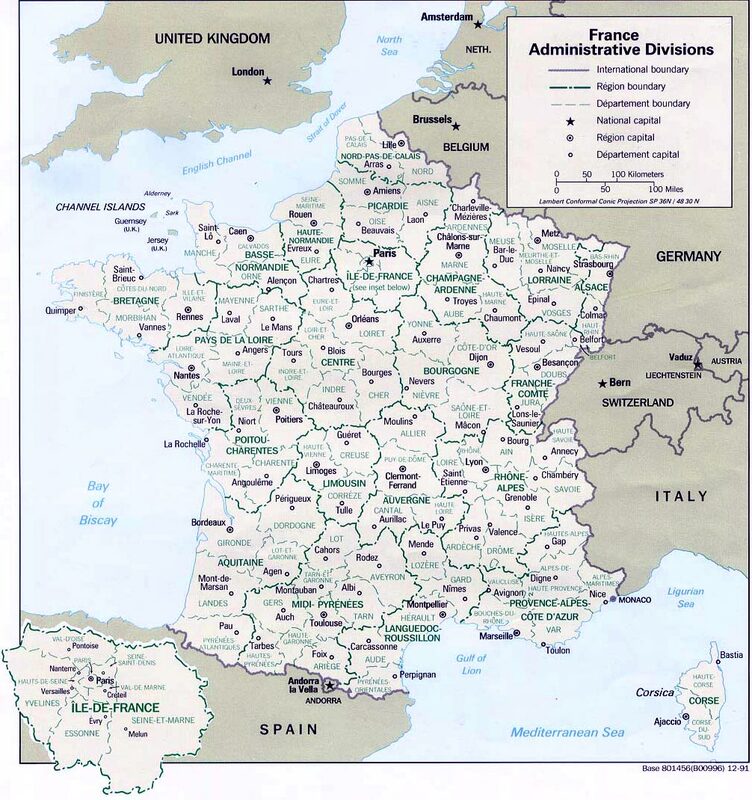 France is divided into 101 departments. They are divided into 343 districts ("arrondissements"), 4 058 townships("cantons") and 36 699 towns ("communes"). Each department has a capital city or prefecture department which includes its institutions. This capital is often the largest city of the department. According to figures, the population median of a department of France was 511,012 inhabitants in 1999. Responsibilities of the department are: social action, the restructuring of rural land, construction, maintenance, college, school transport, ... The removal of one or more local levels is being debated in France for several years and especially the option to remove maps department level. For now, the Balladur committee dealing with this reform did not adopt this proposal, so there is currently no change at the departmental level. Click on the name of a region or a department to view its map and its details. The map of French regions is available in the "regions" menu.